August is an exhausting month in our garden, and on many farms – so much to harvest (successful farming! ), so many weeds growing, lots of irrigation to manage, and we’re not done with planting for another month (and then there’s still garlic!). We are ready for some crops to be finished, so we have more time for other things. Annually at this time, we engage in a “how many watermelons do we need anyway?” conversation. We have passed 400. Our goal is usually 600-800. 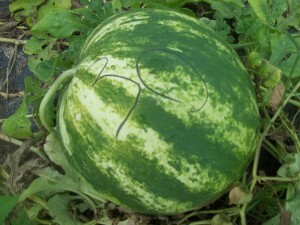 In 2012 our peak day of watermelon harvest was August 9 with 99 melons.This year our peak day was August 6 with 127. 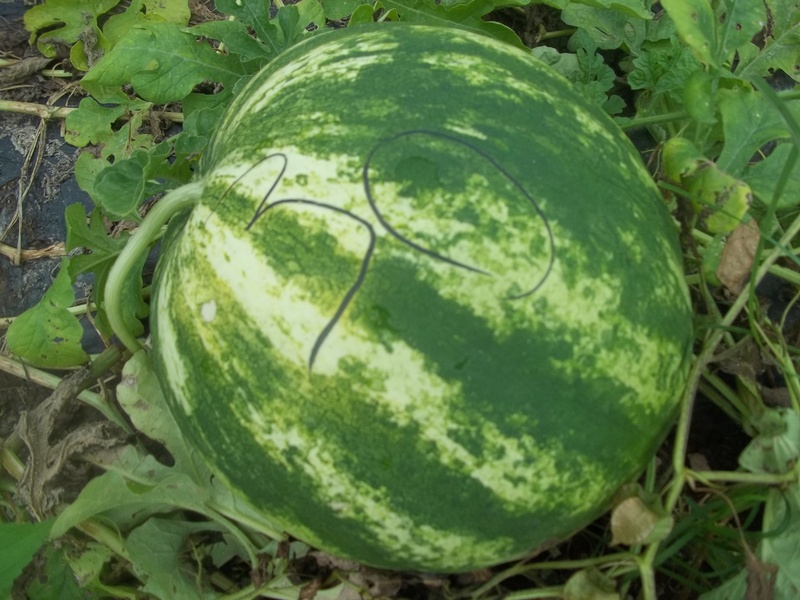 The 30th watermelon selected for seed, marked with a grease pencil. In 2014 we decided to stop harvesting watermelons for eating on September 1, when we reached 531. We processed more for seeds for sale after that. 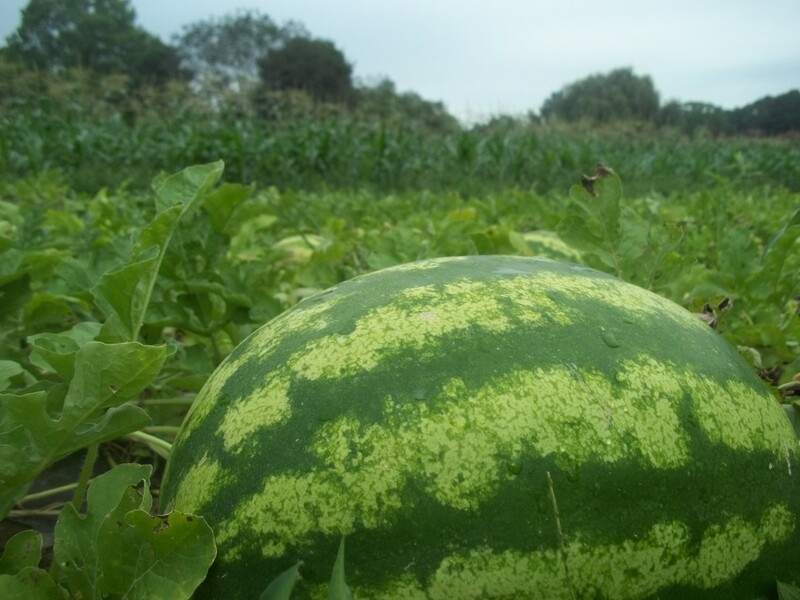 Our Crimson Sweet Virginia Select watermelons are huge and delicious. This summer has not been so hot. We haven’t been eating 22 per day as we do in really hot summers. Maybe we can stop soon? Then we can plant a cover crop of winter rye, crimson clover and Austrian winter peas with plenty of time to grow before next year’s sweet corn crop. As I said, this summer has not been so hot, and ironically this is the third year of our eggplant variety trials, looking for good heat-resistant variety that compares well with Nadia, which we like a lot, but found wanting in the hot summer of 2012. In 2013 we simply counted the yield per plant and compared 4 varieties. In 2014 we weighed the fruits too, to find out if some varieties had smaller fruits. We found that all the varieties we grew have similar sized fruits. Nadia gave the best yield per plant, Epic was second, Traviata third, with Florida Highbush a poor fourth. For 2015 we added a fifth variety, Florida Market, (like Florida Highbush, this is also open-pollinated.). So far this year, Epic is winning, at 4.1 fruits and 3.4 pounds per plant, with an average of 0.84 pounds per fruit. Traviata is running second, at 3.1 fruits and 2.4 pounds per plant (average of 0.79 pounds per fruit). 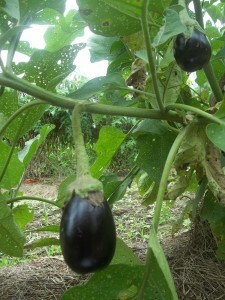 Nadia is third, at 2.3 fruits and 1.8 pounds per plant (average 0.75 pounds per eggplant). Florida Highbush (yes, it is a tall plant!) is beating Nadia on tonnage (2.1 pounds/plant) but losing on size (in other words, more smaller eggplant). Florida Market is trailing, with many days providing no harvest. I’ll do a full report in another month or so, when we decide to stop harvesting. We have at last finished filling the gaps in our endless rows of cabbage and broccoli. We started the transplanting 4 weeks ago. We have been doing this work 7-8.30 pm, and it has seemed especially grueling, as we really needed more help. Lacking enough workers, the job went on and on. We also got into a spiral of shorter daylight by starting late and needing to continue later in the year. And the over-large plants were harder to plant and less likely to do well. And having so many shifts with the irrigation running led to over-watering especially at the low end of the field. And the weeds grew bigger . . . . More people and fewer weeks of transplanting would lead to greater success and more happiness. 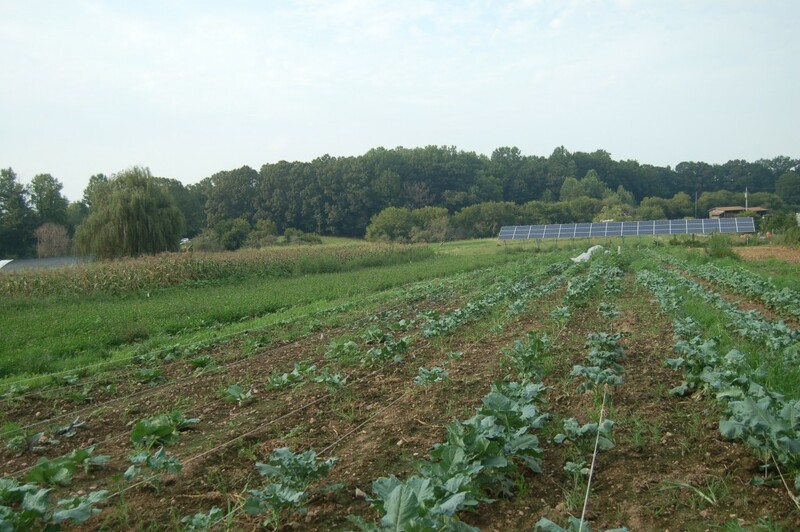 Adjust our crop rotation to avoid the need to plant the fall cabbage and broccoli after the spring potatoes (a very fast turnaround with no slack for things going wrong). Reduce the number of broccoli plants. Increase the number of crew each evening. Stay on top of scheduling people. Leave better information for the crew the next day. This might only save a small amount of time, but it would reduce stress. We use maps and various highlighters to show what’s done. When it’s time to do gap-filling, assign each worker a row, and have them fill gaps in one row as they find them, watering in as they progress. Avoid any temptation to look and count gaps first – it wastes time! No, we really don’t want to do this work in the late afternoons. We’ll stick with evenings.